I’m delighted to share this interview about Susan McTaggart, a dedicated gleaner who travels around the county to harvest from big farms and small backyards at least once per week. When I first met Susan, we gleaned pomegranates and persimmons from a neighborhood in SLO, and another time we met was when she was completing the Neighborhood Harvest Leader training, and the citrus glean continued, even when it started to rain! 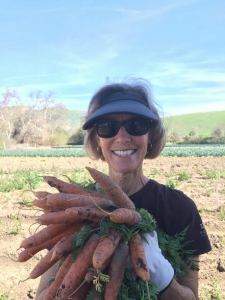 Susan is also a new member of our GleanSLO Steering Committee and has been a wonderful addition, asking thoughtful questions, offering suggestions, and sharing her enthusiasm and wisdom. Thank you Susan, for all you offer to GleanSLO and our community! Please share your name, a few sentences about you, and your background. My name is Susan McTaggart and I have lived on the Central Coast for about 30 years, having first discovered the area as a student at Cal Poly in the 70’s. I taught elementary school in Atascadero until 2014, when I retired and started gleaning. When and how did you hear about GleanSLO? What interests you about the work we do? In March or April of 2014, I heard about GleanSLO on the radio when one of the founders was being interviewed. I think GleanSLO is terrific for so many reasons: it helps people in need, it encourages a healthy diet, it saves food from being wasted, and it promotes community relationships. On a personal level it is a perfect fit for people who like being outdoors, gardening and meeting great people. Has anything been surprising as you learn more about food access and hunger in our community? It’s shocking to me that so many people in our community, and our country, are food-insecure. With 45,000 people in our county needing assistance, it is a big task to meet that need. Providing fresh produce is even more challenging than supplying shelf stable foods, but I feel it is vitally important as part of a healthy diet and as a way of promoting healthy eating habits. That is the role of GleanSLO. Do you have a recipe using local prduce that you’d be willing to share with our GleanSLO community? Here is an incredibly simple recipe that I love. I first ate it on a bike trip in Provence and came home hoping to replicate it. Luckily, I found this recipe in Deborah Madison’s Vegetarian Cooking for Everyone. Peel and grate the carrots. Mix the lemon juice with 1/4 tsp. salt, then whisk in oil. Toss with carrots, parsley and mint, then season with pepper. Serve right away or cover and chill for an hour. This entry was posted in GleanSLO Interviews and tagged GleanSLO Interview, Steering Committee, Susan McTaggart on 03/04/2016 by gleanslo.